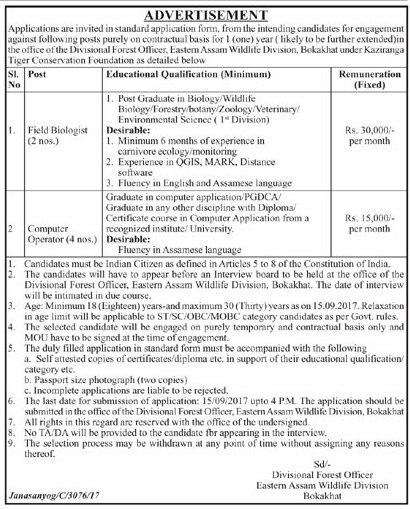 Applications are invited in standard application, form the intending candidates for engagement against following posts purely on contractual basis for 1 (one) year (likely to be further extended) in the office of the Divisional Forest Officer, Eastern Assam Wildlife Division, Bokakhat under Kaziranga Tiger Conservation Foundation as detailed below. Desirable: Minimum 6 months of experience in camivore ecology/ monitoring. Experience in QGIS, MARK, Distance software. Fluency in English and Assamese language. Selection Process: The candidates will have to appear before an interview board to be held at the office of the Divisional Forest Officer, Eastern Assam Wildlife Division, Bokakhat. The date of interview will be intimated in due course. The application should be submitted in the office of the Divisional Forest Officer, Eastern Assam Wildlife Division, Bokakhat.